Looking for a professional basketball job? Do your homework – Contact agents by phone or internet. Whichever is economically feasable for you. 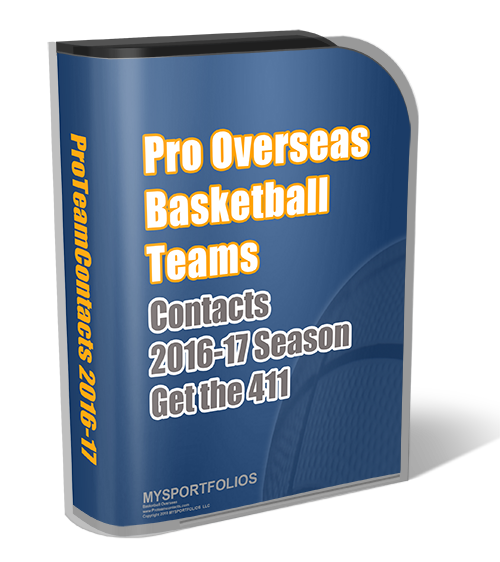 Gather a list of questions that you would like to ask a potential basketball agent. Write down your goals and what you expect of yourself. Be sure these are reachable goals. Know yourself and abilities. Trust your instint. There are a lot basketball scams on the internet these days. If you have one ounce of doubt than you’re probably right. If anything seems to be too good to be true than it probably is. Research, Research and Research. Don’t be lazy, this is your job. Once you have a list of agents or teams that you would like to contact. Do a google search and find out everything you can. Search for former basketball players who are represent or have been represented by this agent. If you follow this simple steps you’ll feel a lot safer and more closer to playing overseas. Don’t look for someone to do all the work for you. If you’re not a BIG TIME well known player you have to get down and do some dirty work! My name is Chad Bailey and i am currently looking for a job overseas in basketball. I am a point guard out of dallas texas. How can i tryout, or get in youch with a coach ? hi my name is latoya and i been looking forward to playing basketball overseas what do i need to do or who do i need to speak with to tryout for a team. Helo i am Berat Latifi i am smart forward i am looking to find a job overseas in basketball , what do i need to do ?? if someone need to speak dont hestiate ask me . Hi, I am approaching my last year of college basketball and am looking forward to a career of ball overseas. What do I need to do to get my career started? hello, my name is Trinidad Bey and im currently seeking a job playing basketball overseas. im 6’3 200lbs and i play the 2 or 3 position. my skills or superb and i want the opportunity to tryout or at least given direction of where go. My name Ronterrian Dale, I am a 6’4 185 shooting guard and small forward. I am from Meridian, Ms. I am looking to play basketball overseas. I was wondering how can I get in contact with an agent or coach. Fill free to send me any information or ask any questions. Jobs for 4/5 woman players with EU passports!!! My name is Walter Webb and I am looking for one of two opportunities of being a player as well as being a coach. I have coached and trained several professeional athletes as well as college-level athletes. I have competed on every level both as a coach and a player. I am looking to have an opportunity to play the point guard position as well as the two guard position. Both of these positions come fairly easy to me. Coaching over 14 years and winning 7 National Prep school championships as well as receiving the National Coach of the Year award from NACA has taken my knowledge of the game to a different level. I look forward to hearing from you. My contact phone number is 210-669-9813. I am currently training in Washington DC. I can also provide you a detailed resume upon request. I can be reached via email or phone. Thank you for your time and consideration. Hello. My name is Shristy Kumar. I played for Cal State Stanislaus in California. I just graduated and my season just ended. I am really interested in looking forward to come watch some overseas basketball and potential to have a try out. If you can let me know or have any information for me regarding that, that will be great. Thank you. Hello,my name is Adam.I looking club on new season,Can any agents help me?This my website http://www.lopez.x12.pl and I have too my film on you tube; lopez basketball-Poland. I came from Poland. I am 27 years old, and I have played basketball for 15 years. My career started in LKS Lodz.I’m a player that play on PG and SG. I can work hard on defense nad offense so I think that my future club will have advantages from my play. I think that my ball grip and shots from the field, makes me a player who’s got a sweet touch, so I make a lot of points and I’m not afraid of making hard decisions of passing or shooting in trouble situations, which can get my team to a win. Tenacity, fight, charisma are characteristics that help me to be a better person in achievement to win. My name is jenna giller. I am trying to find a way to play basketball again. I played at noth dakota state college of science for two years and had a very good career there. After that i went to Florida Atlantic university but had to leave because of some family problems. I mostly played the 2 or 3 spot . How do i get in contact with an agent or coach?